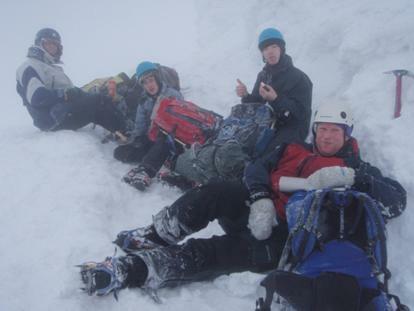 Meanwhile, with their own Winter Mountain Leader, Clive, the Senior Scouts and Rovers were planning a challenging trip to the Scottish Highlands to navigate out onto the Cairngorm Plateau and sleep out in a snow hole. We had a kit night to look at all the special equipment we would need, including 5 pairs of gloves, crampons, ice-axes, snow shovels, mountain boil-in-the-bag food, not to mention all the thermal underwear and group equipment such as avalanche probes! We also had a route planning night to look at the maps, talk about speed, terrain and navigating in the snow, and individually planned routes and looked at possible locations for deep snow for our holes. On 5th February after school/work, we drove up to Pitlochry, grabbed some fish and chips (or in one case battered cheese burger – never again! ), and settled in at the Youth Hostel for a final kit inspection, distribution of shared equipment and last look at the route. After a last visit to the toilets (with the thought of aiming for the poo bags at the front of our minds! ), we set off past the ski runs into the wilderness. 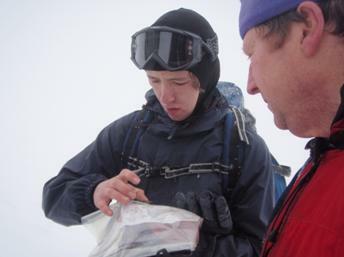 The cloud base was at about 750m, and we were soon in a world of our own, with very limited visibility. We hiked out past Coire an t-Sneachda and Coire an Lochain, and climbed the spur to the west to the summit of Cairn Lochan at 1215m. With full packs, this was no easy task. 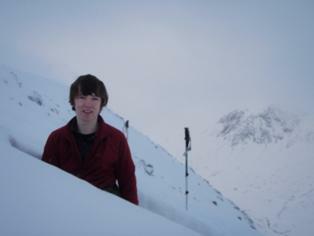 Fortunately, there was no wind and no snow falling, so it was just heads down and climb! For those who came on the Rover trip last year, we were also blessed to arrive after high winds and some freeze-thaw cycles, so there was no deep snow to sink into, which made walking much easier. Once on the Cairngorm Plateau, it was time to think about finding a suitable home for the night, and we descended into Coire Domhain where there is some steep ground. With the poor visibility it took some careful pacing and bearings to finally reach the all important gully. 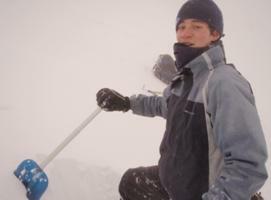 Clive then took out the avalanche probe to start testing the depth of the snow. The first few attempts found only a couple of feet of snow – not deep enough. 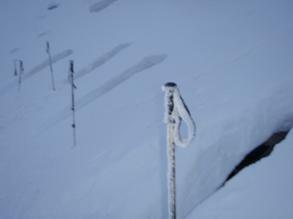 We descended further and further into the steep gully, and eventually the probe went down the full eight feet. We cut platforms for our heavy rucsacs, and a path to work from, then marked out the four doorways for our holes. We were to make a three-man hole for the Rovers, and a two-man hole for the 16 year old Seniors. 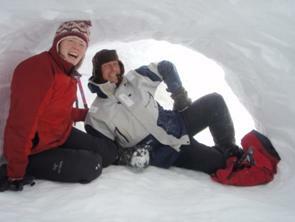 In order to construct a snow hole, each team needed to make two doorways. Each doorway needed to be head-height and shoulder width, and the two doorways needed to be 6 feet apart so that you could lie down between them. Once the doorways were built, we had to tunnel between them to form an arched cave, with a minimum of a foot of snow above the arch for stability and insulation. The cave needed to be wide enough for the number of people meant to sleep in it. The digging was hard work and took each team three hours to be ready for unpacking and cooking. 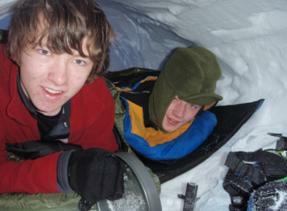 By then we were all really ready for our warm, snug sleeping bags and a hot meal. We laid out the bivi bags, and rolled out our sleeping mats inside them. Then the sleeping bag was rolled out inside the bag on top of the mat. We shed our waterproofs, put on an extra layer of warm clothing and snuggled in. The stoves came out and were fired up, and we dug snow out of the walls of the tunnels to melt for hot drinks and for hot water to cook our chicken casseroles and chocolate puddings. 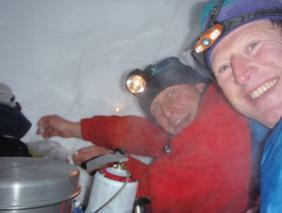 We lit tea lights and sat them on shelves in the snow hole walls, which gave a magical atmosphere. Soon we were all warmed up, and it took no time at all for us all to drift off to sleep at about 9.30pm. We slept well, and didn’t start stirring until 8am. We were blessed with a clearing in the cloud, and had wonderful views across the valley to the crags, and had some beautiful visitors – the ptarmigan birds in their white, wintery colours! After melting more snow for our breakfast, we packed up and put on our crampons and prepared our ice axes for the steep ascent out of the gully. There had been some more snow overnight, and all our tracks from the previous night had already disappeared, but we saw tracks from what looked like a fox and a deer in the fresh snow. Above the gully we were again in white out conditions with 10m visibility, and we carefully took bearings and paced and timed our way up onto the Cairngorm Plateau above Coire an t-Sneachda. In these conditions all features are under snow, so all you have to work with are the contours and cliff edges (which we carefully avoided!). 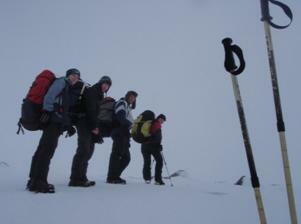 When we got to the top, we took further bearings and headed up the Cairngorm itself. It was another steep climb, made harder with our heavy packs. The sight of the summit was wonderful. We all collapsed to a well-earned crème egg and a hot drink before our final descent into the ski valley and home for a luxurious hot bath and hot dinner. This was a tremendous experience for us all, but also a huge challenge, and only one we could have taken with our experienced leaders and motivated Seniors and Rovers.